It's basically working with a combination of autoattach, antigravity, strand type rigid, a detaching rectangle and fallingattachment. Back when WooBLE where published I discovered that balls with fallingattachment=true can be collected by the pipe even if they are attached. This usually crashes the game with one exception. The game doesn't crash iff the ball get detached after it's in the collector tank. It automatically attaches to the Gooball you want to collect. This activates the pipe and the balls get collected. Now it needs to get detached. The "gm_util_autopipe" ball has antigravity when it's attached. The cache is covered by a forcefield pushing down with a dampeningfactor of 0,6 and antigravity=true. This makes the ball rising slowly untill it touches the ceiling of the cache which is tagged detaching. The cache needs to be high enough that the ball needs enough time to rise up and touches the ceiling right after the collected ball is in the collector tank (the smaller the pipe the better). The forcefiled must be strong enough to push the "gm_util_autopipe" ball down fast after it get detached. It's important that balls get only collected when "gm_util_autopipe" ball is at its lowest point (could cause a crash if not). That's why the player is meant to collect the balls not too fast. I suggest to build a small obstacle in front of the pipe slowing down the speed of the player. There are three more forcefileds, one below the ball holding it ontop the ground of the cache, and one on each side holding the ball off the walls. Otherwise it can't attach itself. All they need is not to be grumpy and the attribute fallingattachment must be set true. The whole setup works best with goos whithout own strands. If you want to see how it works, put visualdebug on or install version 0.1. 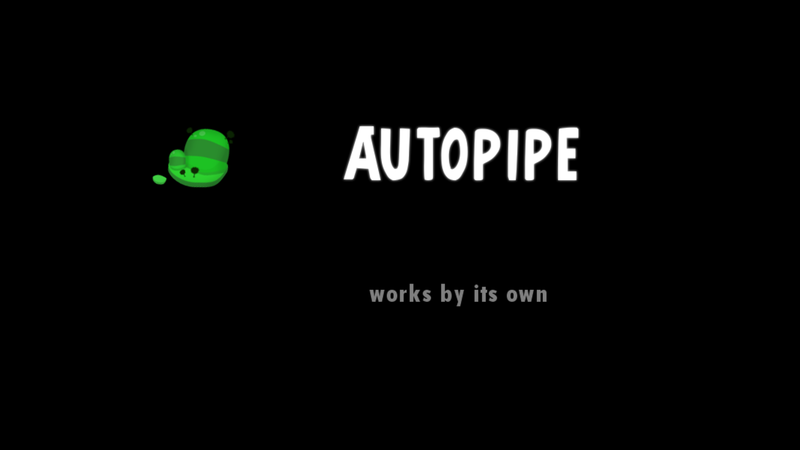 Feel free to use the "gm_util_autopipe in your levels. If you do, tell the player that the pipe doesn't need a goostructure. Some might think: "What a stupid level, where is the goostructure I need to collect the Goo Balls." Good grief, you've done the impossible again. Minor quibble, though: it looks like you left visualdebug on. Is this on purpose? EDIT: My bad, I should have read the description first. Published. Now that you're saying it, I think it's better without visualdebug. When I came up with the idea I wanted to keep this method a secret and use it in the third On the Run level but since it will take a long time untill I'm done with that and GoomodMaker and copcap could use it for their addins I decided to make it public. Ummm... So this one requires a lot of setup and uses some unused features in the original levels which seems to be really easy to cause some problems. (as you've said the game could crash in some cases) But really cool nevertheless. I made it pretty stabil in this addin. It can be just copy pasted into other levels from this sample what's not a lot of work. There's a geom around the levelexit and after I throw some balls on it the pipe can't open! P.S. A funny thing I found in the level. Is it a bug? The geom is essential for this setup. The player is not meant to throw balls at the pipe. You can kick the autopipe ball out of its cache and a thrown ball is most likely too fast for the autopipe ball to attach the thrown ball. For those reasons I suggested in the description to add an obstacle in front of the pipe. I didn't do this because it's just a sample addin. Your screenshot shows what happens if the player collects the gooballs too fast. Didn't the game crash when you did this? It always did when I was testing this. Can confirm that the Goo Balls got stuck in the pipe when I played the level, too. I assumed it was intentional and happened when they detached or something. Didn't crash for me.